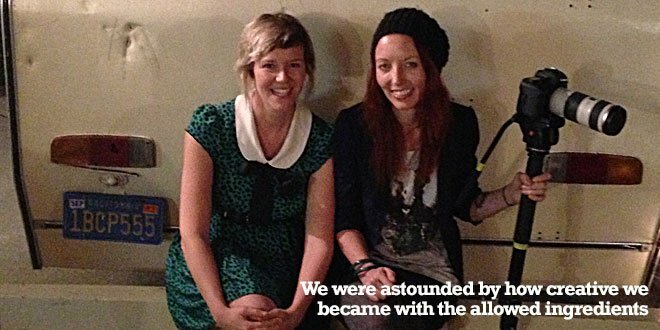 Nearly a year ago, Emilie and her friend Shayna left their homes in San Diego and set out on a year-long road-trip documentary project in a 1978 Toyota Odyssey mini camper. 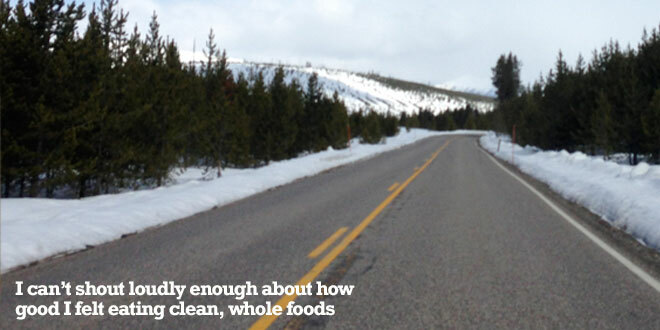 They tried to be healthy, but any way you shake it, life on the road catches up to you. In October 2013, they put their feet down and decided they wanted to eat clean and get a fresh start. So they started the Whole30. This is their story. In February 2013, a friend and I set out from our homes in San Diego and embarked upon a year-long road trip. In the months before departing, we gave up our apartments, sold our stuff, and traded in our cars for a 1978 Toyota Odyssey mini-camper. Our new home was 19 feet of retro ‘70s stripes and shag ceiling carpet. The goal was 50% fun exploration of the US and 50% work research for our documentary film; we had never been more excited. Fast forward eight months: life on the road—from the west coast to the Rockies to Vermont to Brooklyn—had treated us well. And then… we arrived in The South. After spending five days in Nashville doing some birthday gorging on “exotic” foods we don’t have in southern California (read: Waffle House), we knew we needed a change. When my camper-mate Shayna suggested we do a Whole30, starting right then and there, I quickly agreed (most likely because I was in the throes of a SonicBurger hangover and wasn’t thinking straight). 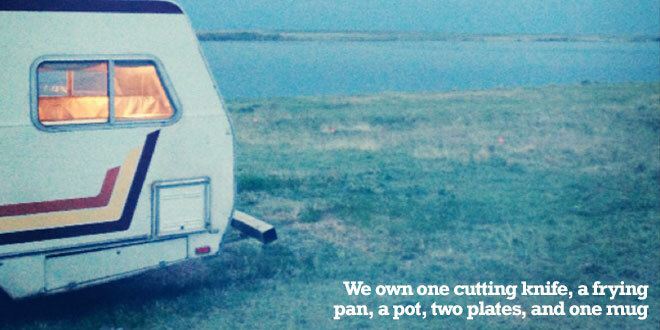 The facts were these: well, first off, we live in a camper. Not one of those fancy mobile mansions that are bigger than your parents’ house, but a tiny one with no running water, no refrigerator, and without an oven. We have a three burner stove top, of which two burners work. We own one cutting knife, a frying pan, a pot, two plates, and one mug (the other one broke and we didn’t want to spend the money to replace it). Until recently we were using plastic forks, but I splurged for two real ones at a thrift store in Tennessee. To store our food, we use a red cooler a friend in Cape Cod gave to us. On top of that, we didn’t get a grant to do our documentary. We didn’t save up much to take on the road. We simply went. At this point in the journey we found our funds to be extremely S T R E T C H E D. Hospitality and occasional freelance work kept us on the road, so it seemed like the most nonsensical time to stop taking free meals and embark on the pickiest eating season of our lives. But we were tired of feeling badly from putting junk in our system and we mustered up the resolve to say “NO” to stuff that shouldn’t go in our bodies. I had tried doing a Whole30 before, but found I wasn’t able to do it alone. 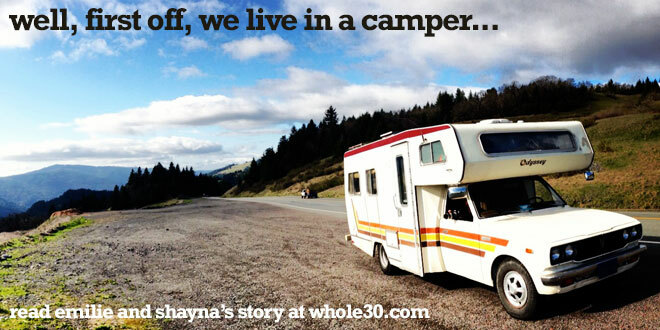 Having Shayna in the same boat (camper) as me helped tremendously in terms of Whole30 success. The first major test of our resolve was when we went to stay with a sweet southern grandma just outside of Nashville. If there was ever an evangelist for southern home cooking, Lee was it. From the moment we walked in to her house, she smothered us with hugs and promises that she would feed us better than anyone else. Though we had prepped her regarding our eating habits, I don’t think she truly believed us, or perhaps an intense paleo-style diet is just hard for an old school southern-paradigmed grandma to adjust to. I don’t know if it was harder for us or for Lee; she seemed absolutely crestfallen that she couldn’t treat us to her cooking, which also seemed to be the way she showed love. We had mentioned that we could eat eggs, so the next morning when we awoke Lee was already hard at work in the kitchen. I watched in horror as she dumped almost a full cup of half & half into the eggs she was scrambling. At the breakfast table I tried to make secret motions toward Shayna regarding the “infected” scrambled eggs while I munched on a hard boiled one. We never knowingly broke our Whole30 while there, but after the Scrambled Egg Incident, we realized that there were probably lots of non-Whole30 compliant ingredients unknowingly slipped into the meals we were eating. We decided to start over, day one again, when we left Lee’s. From there came a lot of days where we were just on the road, not staying with anyone, and we got into a great habit of stopping mid-day wherever we happened to be (sometimes a McDonald’s parking lot, sometimes a state forest) and taking time to cook and eat a lunch. We were astounded by how creative we became with the allowed ingredients, and I must say it was kind of a thrill to be sitting on a blanket eating tilapia with Brussels sprouts and purple Asian sweet potatoes while watching people order Big Mac meals at the drive-thru window (for roughly the same price!). Since we were living out of a cooler, we had to stop for groceries every couple days. We’d find what was cheap and in-season and eat that different ways for a few days and then hit the store again for whatever else was cheap and in-season in whatever region we were in. Sometimes we would just buy local meat at the farmers market and hit the grocery for the cheaper produce. We discovered some favorite foods among things we hadn’t really eaten before: spaghetti squash, butternut squash, and sweet potatoes. And all three really cheap. We could only really make the squashes when we stayed with someone who had an oven, but the sweet potatoes kept really well in the camper and helped satiate us on longer days. And when we discovered ghee, my whole world turned upside-down. Garlic and all sorts of different onions are cheap and can flavor a meal differently every time, and eggs are easy and keep fairly well. Go-to meals on the run ended up being things like taco salad, “Cobb” salad, and leftovers from the night before. It was refreshing to be grateful for simple things. At my vegetarian relatives’ house we ate vegetables at their table and then cooked meat in our camper for dessert. We washed dishes whenever we could, and sometimes ended up washing them “in house” (a good paper towel wipe-down in the camper). I was always a little anxious about the price at the supermarket checkout but once we looked at the receipts and divided the cost by two, we realized we were most certainly SAVING money by choosing to eat simply and not eat out, even when we bought the $5 carton of eggs. Doing the Whole30 with a friend made it more fun and cheaper, since we could share the cost of basic cooking ingredients like coconut oil and ghee. I’m not saying it was easy when we had to pass up free glasses of fine red wine at our friend’s bar in Durham, NC. But I can’t shout loudly enough about how good I felt eating clean, whole foods and how powerful it felt to say “no.” Every time we finished a meal we marveled about our energy levels and about how satisfied we felt; I slept better too (in a camper on noisy city streets!). In addition, I feel like I have a real jump-start on changing the way I relate to food; slowly, how I think about sugar and novelty foods is shifting. Thirty days was just enough time to uproot my old habits and help me lean into a new kind of lifestyle. 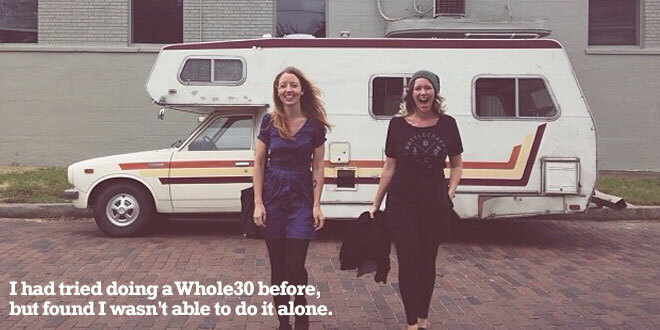 I wouldn’t say our situation was ideal, but all in all, my thought is this: if you’re thinking about doing the Whole30 and aren’t sure you have the resources, just imagine two plucky film-making gals traipsing around in a 1978 campervan full of sweet potatoes, and be very encouraged. 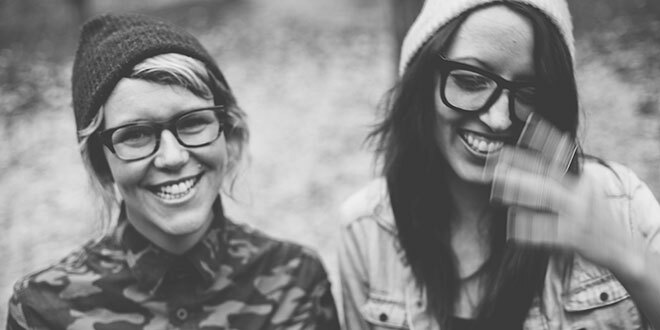 Emilie and Shayna will be on the road until late February. You can support them by sending them jars of ghee, hiring them ([email protected]), and following their journey on Facebook: facebook.com/holysmokesproductions; Instagram: @holysmokesproductions; and Vimeo: vimeo.com/holysmokesproductions.